Have you ever wondered why huskies, border collies, and some shepherd dogs have those piercing blue eyes? Consumer genetics, made popular by companies like 23andMe and Ancestry, may have provided an answer, according to a new study conducted by researchers from the canine DNA startup company Embark Veterinary, Inc. The study was published in the journal PLOS Genetics and it’s the first of its kind to use consumer genomics with non-humans as well as the largest canine genome-wide association study ever conducted. Consumer genetic testing has given people an unprecedented look at their DNA and genetic history. This is all made possible thanks to large databases of genomic data, and now this new study shows how consumer genomics can shed light on animal traits that have yet eluded scientists, like the blue eyes of the Siberian Husky. 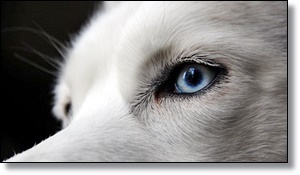 To read more on this story, click here: What Gives Huskies Their Piercing Blue Eye Color? FOLLOW US!